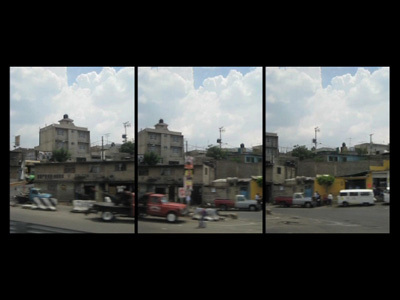 The video material was filmed during a trip to Mexico to participate in the laboratory 'Who is afraid of the in-between?' organized by Werner Moebius and Mariella Greil as part of the Prismaforum, which took place in Oaxaca and Mexico City in 2009. The video explores the phenomenon of the cabin as a moving container in transit. Its movement through space creates another dimension of space and time for the traveller, which is quite different to the dimension of walking speed. The window acts similar to a screen or interface making this different dimension appear. The rapid movement through space creates a fascinating perception, which I tried to capture with the camera. Fast travel could be seen as a means of teleportation creating a kind of displacement for the travelling subject. The still or moving image taken from one place and carried to another place could be understood as a teleportation too.